I wonder why I have never blogged about Hoo Yee Kee before although we have been there like at least 10 times last year. KL is definitely not famous for coming up with really good prawn mee, oh well, not as good as the ones you can find @ Burma Rd, Penang, or 3rd Street, or the McAllister Rd Prawn Mee which I rave about so much. My take on HYK prawn mee, is that, it's a stall that serves up a half decent bowl of Prawn Mee, for people in KL. 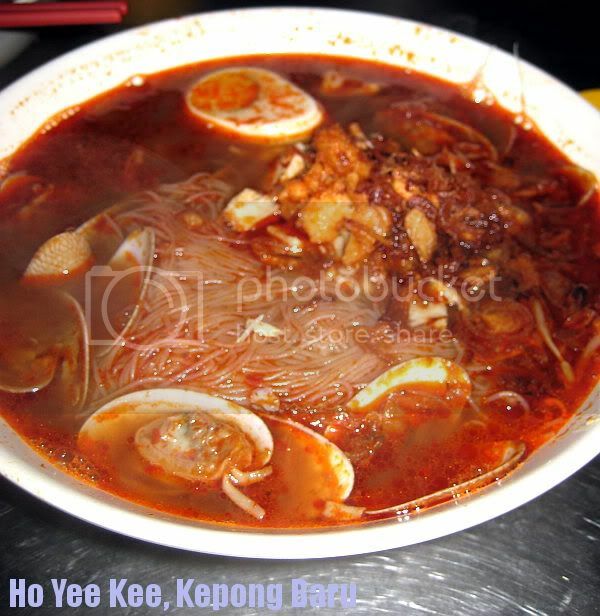 If a restaurant like Oldtown can serve prawn mee like this in KL, HYK's prawn is like 10 times better. This time we came over with Steve, who also knows this place very well. 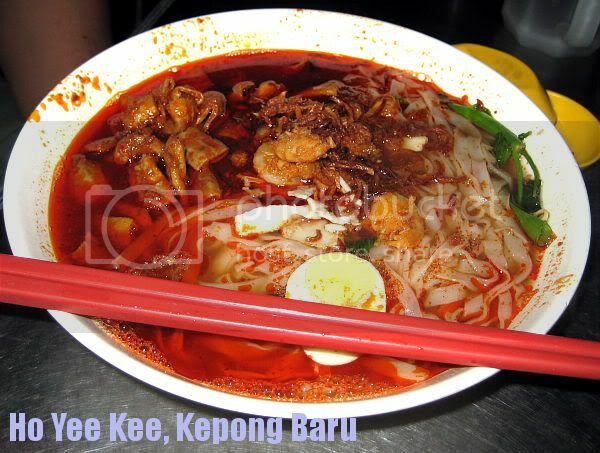 He ordered this bowl of Prawn Mee, Koay Teo , add Pork. If not mistaken this bowl is for RM9. Its a generous serving of extra pork there, and this stall also don't seem to stinge on giving noodles. Sayang and I both opted for bee hoon, with extra Clams. Yummy. To sum up, this place serves a decent prawn mee. A standard bowl of prawn mee costs, RM4.50, and should you want to customize and add more stuff like extra ribs, extra prawns, seafood, etc you can do so. 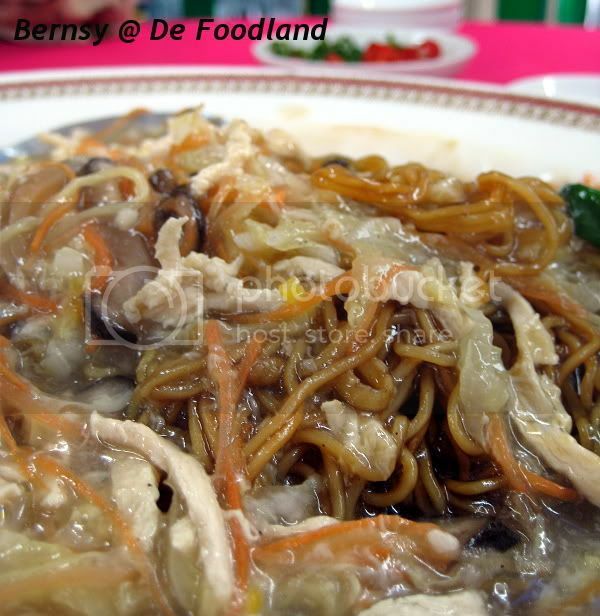 They also serve other types of noodles like lum mee, curry mee, etc. Kuanfoodfetish - got pictures of the place during the day. JoanChew @ Aman Puri their new restaurant. 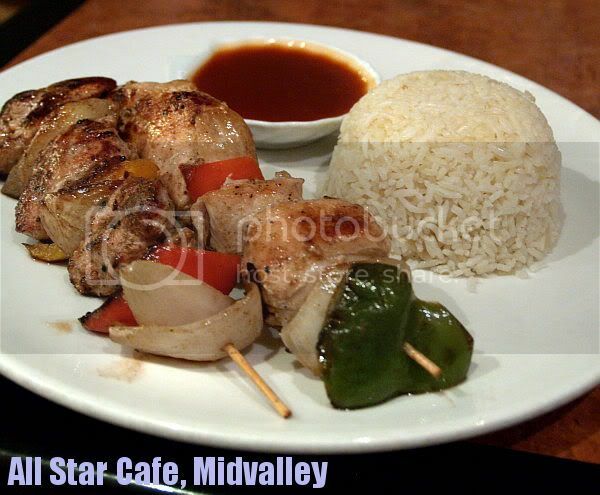 Remember the last time we went to All Star Cafe ? We complained about lauya service ? Armed with that in hand, we went back one more time to have lunch, after all, the variety available in Mid Valley can be quite expensive. 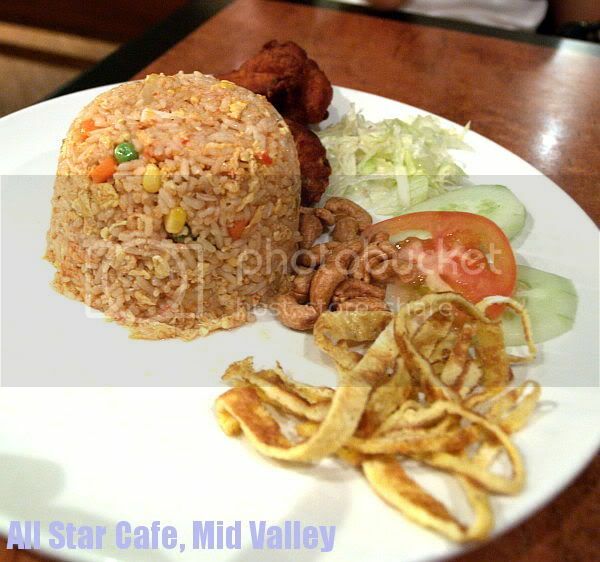 Sayang ordered this TomYam Fried Rice, served with one piece of fried chicken, cashew nuts and some fried egg. The rice although formed like a bowl, it was quite a generous portion. I liked the taste, although I thought the serving of the fried chicken could be a little bigger. But Sayang didn't complain. 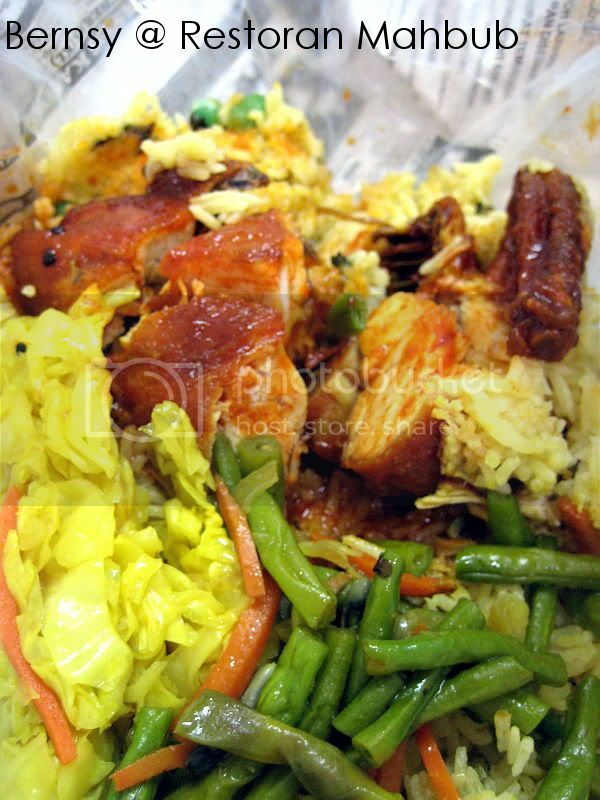 I ordered this chicken kebab rice. This two sticks of sate had a lot of meat in it, and I totally liked it because it was marinated with quite a bit of lemongrass. Mmm... tasty !!! The meal was quite affordable, only came up to less than RM40 for both of us plus drinks. The service may have improved a wee bit, but don't expect too much. Food's quite nice there. 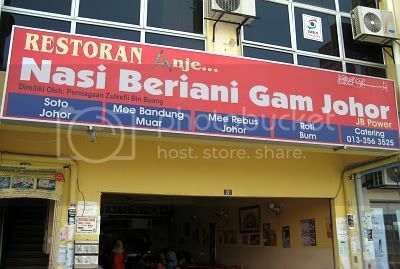 Do read about my previous post on their Bangi branch here.. Sometimes when you drive pass a restaurant, if it is packed, you always wonder why. Food good meh ? Is it expensive ? and other stuff that goes on. We drive past DeFoodLand quite a bit, and usually on the weekends, this place is full to the brim, 2 floors of a corner shop lot in Manjalara. 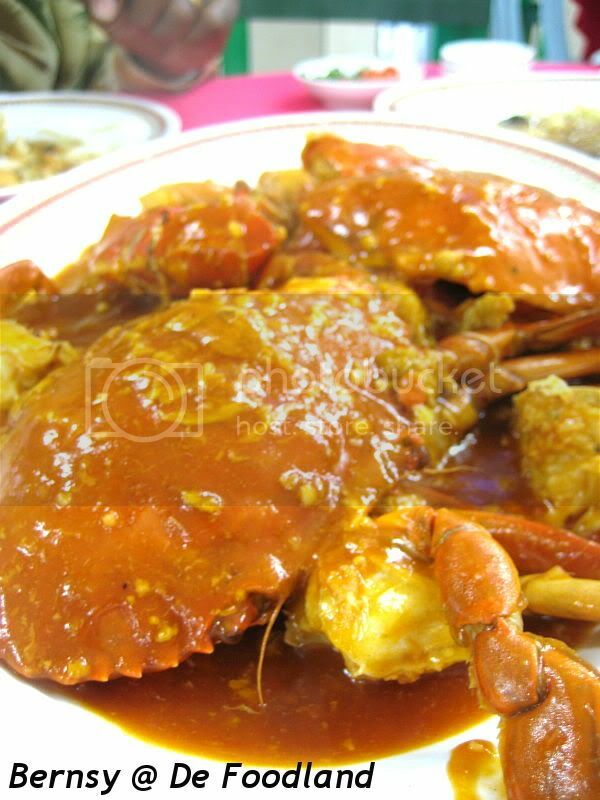 I know one thing for sure after doing some research, they are famous for CRABS. Our first visit, we only ordered one vege, and one serving of their signature, Butter Crab, which I found rather disappointing. The crab was good but cooking was not. Anyways, since it was Mom in Law's birthday, instead of going to the usual Fullwealth, I suggested why don't we go try D Foodland. So we ordered this 4 heavenly kings, which I thought was different. 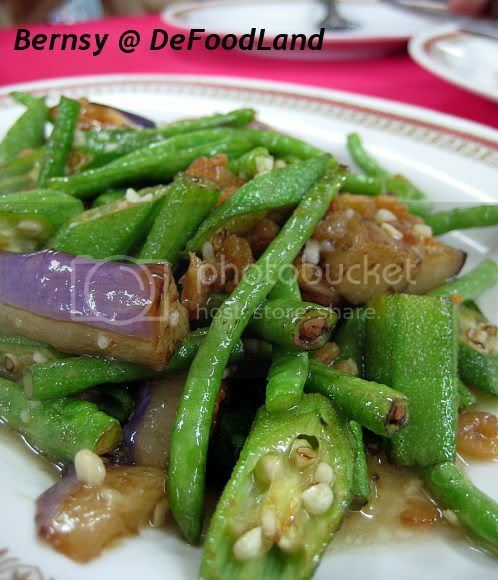 Its cooked with little dried shrimps and garlic, minus the chilli. Instead of rice, we ordered long noodles which symbolizes longevity. We also ordered this sweet and sour crab, which I thought came out a disappointment. The crabs were fresh, but the way they cook it, really can be improved. Even thought the crabs were fresh, I have had better crabs than theirs. 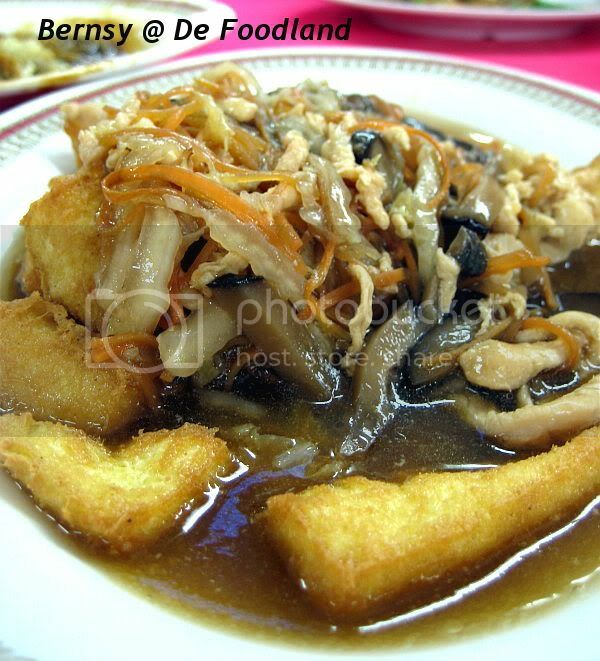 Anyways, the fried mantau was good, and we ate with the sweet and sour gravy which came with the crab dish. In the end I found this place rather disappointing when it comes to crabs. I am not sure if it was the expectation or it is just me. I thought the vegetables and the tofu dish were nice, they cooked it well. The prices here are slightly higher than most eateries in Kepong, taste wise, I find it just so so. Ok la.... but their crabs were a disappointment. Order anything but their crabs if I were to return. I was given a task to tapau sandwich for Sayang one of those afternoons, but as I drove over to meet her, I thought it was quite easy to find a place where I can buy some sandwich. I remember most Shell Petrol Stations sell them, but I did not come by. I was quite sure, that cafe in Lucky Garden sells them sandwich, and while I ordered the sandwich to go, I took a 2 min walk and I saw Mahbub. 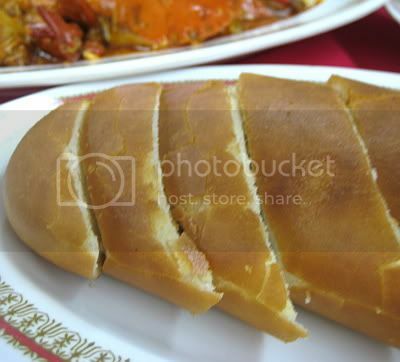 I was curious to see what people were eating, because it did not give me the vibes of "just another mamak". Most people do briyani here, so I also ordered one briyani, bungkus, and ordered Ayam Madu (since I missed out on Zabrullah's ayam madu). I found that their Ayam Madu was nice, crunchy on the outside and moist on the inside. Very nice, sweetish. 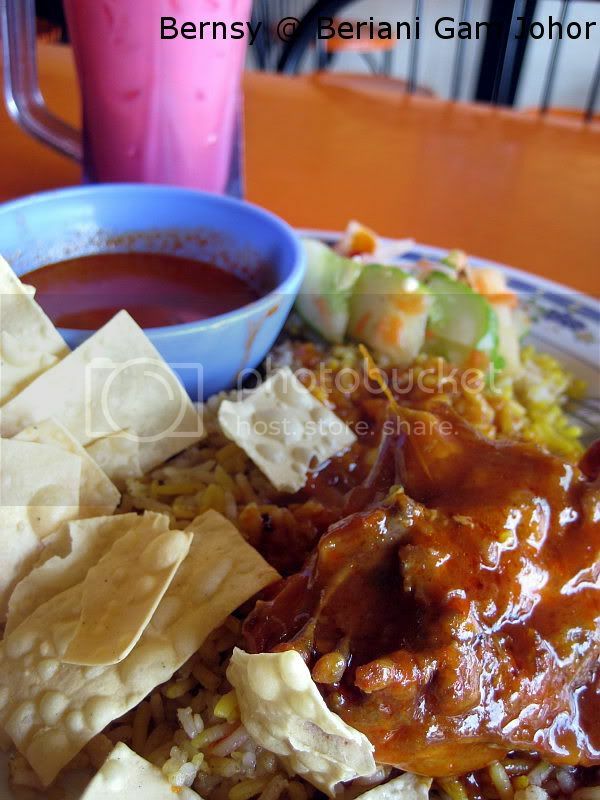 The briyani is also served with two side vegetables, and gravy of your choice. The downside though, was that pack of rice cost me 10 bucks. Abit high for some honey laden chicken rice, if you know what I mean, otherwise I thought the food was quite good. After being absent for so long (this will explain why), I am finally back. After a much needed one week break at Langkawi ( my virgin trip ), came back, recharged, and ready to work. 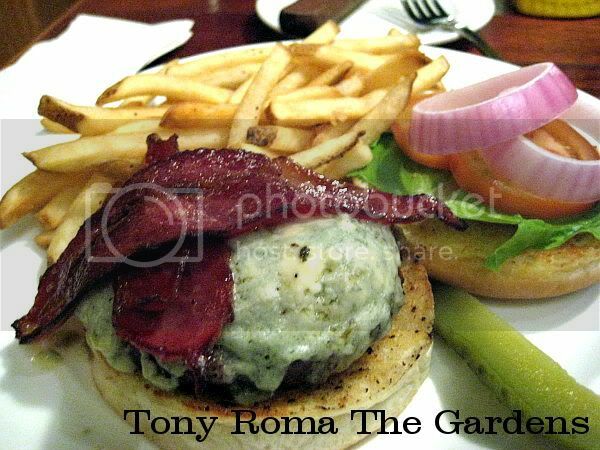 This is actually the prompt revisit of Tony Roma after the Pavillion experience. We went back in a jiffy, as Sayang wasn't quite happy with her previous salad bowl, tuna one, too fishy and too our for her. I wanted to try something different but did not want to over stuff myself, so I asked for a Blue Cheese Burger. It came with onions, pickles, insufficient lettuce leaves, two strips of beef bacon , and a huge beef patty wrapped in blue cheese ( kinda reminding me of Ramli Burger's Spesial burger, only difference is that the wrap is blue cheese, not egg). 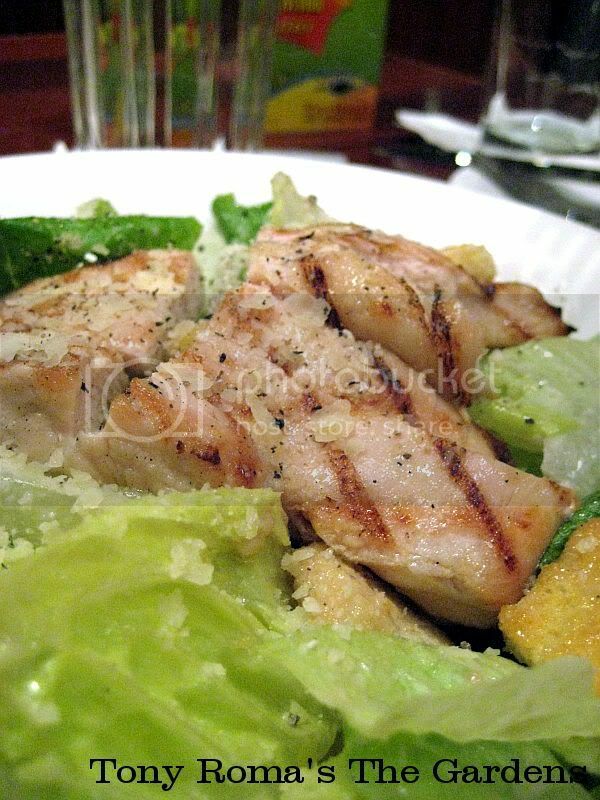 I believe we will be coming back to TR's soon for more salads, because I believe its worth it. Should you go in after lunch and before dinner, Tony Roma now has a 50cents promo for coffee and hot chocolate drinks. The salad's about RM20 and the burger is also about RM20. The bill came below RM50 for both of us, and I think its good value for really good food, although I might sound like I am patronizing them, it really was a good meal.